For updated information on current projects, please visit our Facebook page and check our upcoming news. CPP will be welcoming a dedicated website in March of 2017. Click on the gallery link to view more images of our work. Poetry and the Fate of the Senses (2002), and The Open Studio: Essays on Art and Aesthetics (2005), a collection of her writings on contemporary art. Ms. Stewart will visit UConn on April 1st and 2nd as the 52nd Wallace Stevens Poetry Program guest. Her visit is sponsored by The Hartford, the UConn Humanities Institute, The Aetna Chair of Writing, the Creative Writing Program, and the English Department Speaker’s Fund in the College of Liberal Arts and Sciences. Students printed one of Susan Stewart’s poems as a limited-edition letterpress broadside. It was created by Design Center Studio and hand-printed by student artists in the Printmaking studio. Long River Review literature editors and Advanced Printmaking Workshop students worked together to create a hand-pulled print. The limited edition artwork was inserted in the 2015 issue of Long River Review. Counterproof Press worked with The Office of Public Engagement, Political Science faculty, Art faculty, Cultural Centers on campus, and students in Political Science, Printmaking, Drawing, and Graphic Design to create a commemorative broadside for Constitution Day events at UConn. The broadside was the outcome of a collaborative project that explored how some constitutional rights might apply today. A range of students contributed to the content and design. John Schulz will give a presentation on his work to students in the Department of Art and Art History. He will work with Counterproof Press to create a suite of 5 letterpress printed images. Described as “one of America’s most original, influential, and productive of lyric poets,” Carl Phillips is the author of a dozen books of poetry and two works of criticism. His most recent books of poetry are Silverchest (2013), Double Shadow (2011, winner Los Angeles Times Book Prize for Poetry and finalist for the National Book Award), and Speak Low (2009, finalist for the National Book Award). Graywolf Press has published two collections of his essays: The Art of Daring: Risk, Restlessness, Imagination (2014) and Coin of the Realm: Essays on the Life and Art of Poetry (2004). Oxford University Press published Phillips’s translation of Sophocles’s Philoctetes (2003). His work has been anthologized in The Vintage Book of Contemporary American Poetry, (Vintage Books, 2003), Gay and Lesbian Poetry In Our Time, (St. Martin’s Press, 1988); and The Vintage Book of African American Poetry (Vintage Books, 2000). Phillips’s honors include the Kingsley Tufts Poetry Award, a Lambda Literary Award, the Samuel French Morse Poetry Prize, an Award in Literature from the American Academy of Arts and Letters, the Pushcart Prize, the Academy of American Poets Prize, induction into the American Academy of Arts and Sciences, and fellowships from the Guggenheim Foundation and the Library of Congress. Phillips served as a Chancellor of the Academy of American Poets from 2006 to 2012. He is Professor of English and of African and African American Studies at Washington University in St. Louis, where he also teaches in the Creative Writing Program. Students printed one of Carl Phillips’ poems as a limited-edition letterpress broadside. It was created by Design Center Studio and hand-printed by student artists in the Printmaking studio. in 1951. He has published over a dozen collections and has been honored with the Pulitzer Prize and the T. S. Eliot Prize. He visited UConn on April 10 as the 51st Wallace Stevens Poetry Program guest. His visit was sponsored by The Hartford, the UConn Humanities Institute, and the English Department Speaker’s Fund in the College of Liberal Arts and Sciences. 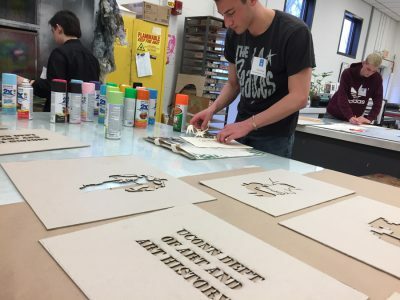 Mr. Muldoon generously allowed students to print one of his new poems as a limited-edition letterpress poster created by Design Center and hand-printed by student artists in the Printmaking studio. This was the inauguration of what we plan as an annual project to coincide with each year’s visiting Wallace Stevens Poet. Happenstance involved a collaboration/encounter between a group of student poets, artists, and designers. 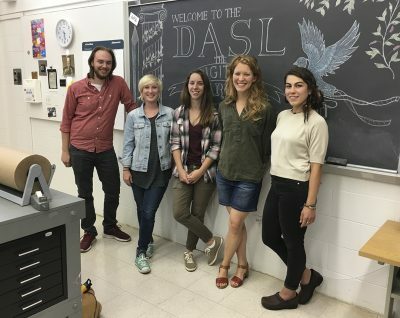 Happenstance was an improvisational and experimental creative charrette held at the Printmaking facilities in Bishop facilitating dialogue between poets and visual artists. 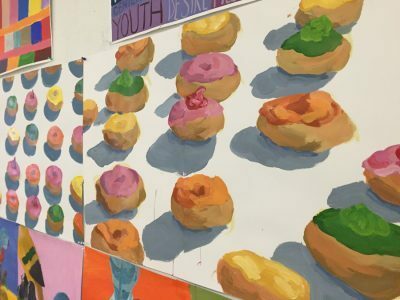 Sharon L. Butler, an artist and writer, maintains an award-winning art blog, Two Coats of Paint, and is represented by Pocket Utopia in New York. 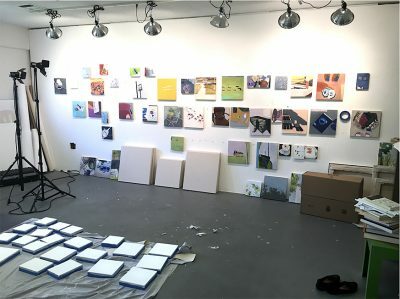 Her paintings and drawings are included in private collections in New York, Los Angeles, Boston, Baltimore, Tampa, Philadelphia, Providence, Berlin, London and Kyoto. Sharon Butler was in residence throughout the semester to create a series of prints. Students benefitted by learning to professionally edition the works and by observing Sharon’s art and process. Louise Menzies (NZ, lives and works in Auckland) explores past and present through her cross-media practice that has incorporated film and print into performances and installations. Her work has been exhibited in prestigious international venues and is represented in numerous collections including the Chartwell Collection, Auckland Art Gallery, Toi o Tamaki, Auckland, New Zealand. She is an artist in residence at the University of Connecticut Contemporary Art Galleries. 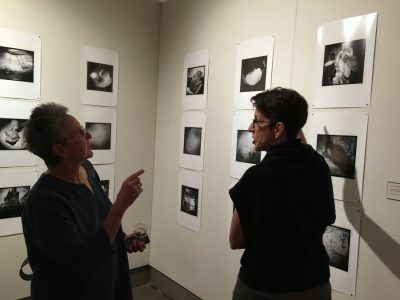 Her handmade paper/inkjet prints created with Counterproof Press during her residency are included in her current solo exhibition in the Contemporary Art Galleries, and she will work with graduate students to complete an additional edition of a single work. Attendees will create his/her own limited-edition (sets of 10) 10×10 print, using different methods at the UCONN Print Shop. Sponsored by Mohawk Papers.